Content and images Copyright © 2007-2018, Spice-Club by Cham; All Rights Reserved. Ask first at Spiceclub@hotmail.com before use of any text or images on this website. Parotta is a layered flatbread. It is flaky, buttery and heavy filling (because of Calories)! You are going to see it how it is high in calories...Not be confused with Parathas from North-India. This parotta is a roadside trademark in Tamil Nadu, Kerala. In Kerala, they call it Malabar porotta/parotta. This small shop opens their door for business after 6 pm and they keep making, rolling, and chopping this parottas even after midnight. They just serve this parottas with Saalna (with meat or without meat gravy) or it is “Kothu Parottas” means minced parothas, onion, spices, egg, saalna and sometime meat too). All T.N people will love this roadside tasty parottas. My mom has never made at home. Why she should prepare when you get those flaky bread every corner of the street. But in US, when we crave for those items you have to bend yourself. So roll up your sleeves and let’s have fun with the dough. Skill level: If you are confortable with rotis/parathas , this parotta cooking skill is intermediate or otherwise could be difficult for beginner. Take a bowl, add all the ingredients except water. Pour the hot water and with a wooden spoon mix it. When the dough is little cool to touch, knead for 5 minutes and make a smooth ball, smear the oil and cover it. Let it rest at least 1 to 2 hours. I would advice to let it rest 5 to 6 hours, it is easy to work later. My ellaborated steps seems to be too long don't be scared. This parottas are pretty easy to make it! If you are first time maker (or Dummies), prepare the dough morning and make it the parattas evening or night. It is easy to work out. My North- Indian Parathas which is totally different from the South Parotta. My South- Indian Parotta & North -Indian Parathas are reaching Srivalli's event Roti Mela. 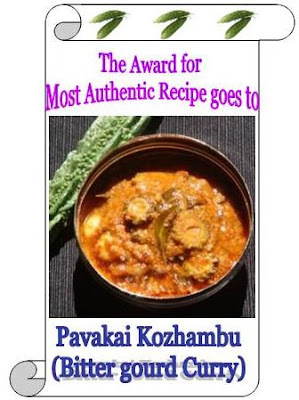 After a tie, My Pavakkai Kozhambu has taken the Most authentic Recipe Award created and hosted by a Creative lady Pooja. Thank you each and everyone who voted for this traditional recipe! Old is Gold , this gravy is pretty known in all Tamilian's house. Thank you Pooja. I make Roti Canai like this. It is hard work indeed. All that folding and rolling to feed 4 people but worth it in the end! Looks great. A very clear and nice step by step guide to making layered parotas. have made it a few times.. long before. congrats for the authentic bittergourd recipe award..way to go dear. Turn a steel plate, roll the dough thin and fold the edges down. brush with oil and try to lift one corner , you will get automatically some pleats and make a spiral! Yes, to make to 4 adult people is hard! I make only 5 parattas! Prema.S:Thank you, I too love to eat with Chick Saalna! Ranji If the parotta shrinks back. The dough is not ready yet. Let it rest pretty much 5- 7 hours , like i mentionned in my post, did u see my pict it didn't shrink. Hope u will get a nice parotta after seeing my instr and post. I did dat too dear :( nyways thanx for ur concern..
Wow.. I love this layered paratha with vegetable kurma !! Recalled my school days :) !! Very wel explained.. Thank you !! they look yummy, reminds me of mama she used to make these for us, I think she used to call it lacha paratha. Yummy with any gravy. Wow, parotta looks delicious. step by step process.. thats good. There was some prob wit my internet so couldnt reply nor publish all my comments.How are u doing. i just loved ur parotta.. it looks mouth watering. congrats on ur award cham!ur parotta looks great..am craving for these..do u know tuticorin(my place)is famous for parottas..can u send me some ! Wow, Cham! Hat's off! nice instructions. Never made paratha before. YOur recipe makes me to try it. Perfect entry for roti mela. that is super - love the step by step! my husband loves porottas - i'm sure he'll be totally surprised if i try this out! :) thanks! Hard work bit SO worth it! I love the flaky parotta! Ur instructions are super!!! Reminds me, I haven't made these for a LONG time! Cham u made it too fast.Actually this is in my draft for Roti mela.Love the instructtions. Very neat illustrative depiction for dummies like me, Cham. I've tried it twice but it is not worth mentioning. Maybe I'll try this method. Did you get 5 parathas for 1 cup flour? Congrats on the Most Authentic Recipe Award. I have one surprise for you tomorrow. WOW Cham...Parotta looks awesome, i don't have any words dear, divine, jus amazing. hats off to u gal!!! Congratulations for bittergourd recipe award..keep rocking!!! Madhu read the note, follow the dough rest time, and u can enjoy some flaky bread. Yes u can make 5. Cham mouthwatering yaar:-)...will sure try. wow,,,nice one,,havent tried layered prota..can try now from ur recipe..
the home made parathas look so yummy, I hardly have the enthu to make them from scratch, its always frozen for us. wow! what a lovely tutorial, u sure hv lot of patience, cham :) i've tasted it & it sure is YUM! This is really tempting...Never mind the calories when these taste so so good!!! Nice demonstration. The pain of making it is worth it in the end! Looks Great!! stunning presentation Cham..:D thankx for step by step pics. Congrats on ur award too! Cham, I've been looking high and low for a recipe for this type of Parota, you made my day dear!!!!!! :):) Very good illustrations, perfect!! Cham , thanks for sharing the tips, I always wondered about the layering. This is iteresting,saree pleating !!!!!!!!! I am going to surprise my hubby!!!!!!!!! Hi, gr8 step by step instructions for making parattas.now i think i can try it out and thanx for the recipe too. After so many previous failed attempts i am trying ur version layered porotta today..keeping my fingers crossed:)...its been 3 long yrs since i had this and i am dying to have it...hope it comes out well..will let u know tomo..:).. I missed this post as i was on a break that time and now i came here through Ranjis place. They looosk so delicious and pro. I have bookmarked them also. Cham thats one beautiful parotta..thanks for sending this entry.! Came to your blog by way of Roti Mela Round-Up. These look delicious! I can't wait to try them. I made this parotta and they came out so soft and delicious. Thankyou for the wonderful recipe. It is a keeper recipie for me. Dear Cham, I made this parotta for breakfast and it was a hit with my family. Thanks for sharing anice recipe. I was looking for a perfect porotta recipe for a while now.I had tried recipes from a few food blogs run by indians and had some success.But the best recipe and instruction for Porotta or Prata as they call it comes from a Singaporean chinese guys.He is a doctor by profession and has done signifcant research on the perfect porotta recipe with all the science that goes with it.There is also a video demonstration of how to master the porota flipping technique.